There are three secrets to copywriter success, building a great writing business, and setting yourself up to land writer jobs with ease. PWA helps you unlock each one and put it to use – FAST. 3. Get Good — FAST! Membership in the Professional Writers Alliance delivers each of those secrets to you on a silver platter and gives you the chance to leap forward toward the writing life you really want. There’s no other copywriting community like this anywhere – and there’s never been a better time than right now to join. What makes PWA membership so critical to your copywriting career right now? Thanks to the Internet, you can connect to all kinds of advice for writers online. But only PWA helps you cut through the noise to connect with the people and resources that truly matter in the world of direct response writing. Only PWA offers you the opportunity to connect with a tribe of like-minded working writers – peers to support you, experts to lift you up, and industry leaders to inspire you to take more action, more often. And only PWA provides you with proprietary writing business training to keep you on the cutting edge of the industry while also spoon-feeding you a curated collection of top-notch copywriting job leads. The longer you work alone or sit in isolation from the PWA community, the longer it will take you to create abundance and success in your writing life. Why delay your own prosperity and happiness when PWA is open to you right now? Potential clients crave signals that they’ve found the right partner when they hire a copywriter. An easy way to signal that you’re serious about your copywriting career and are the right partner for any project is to display recognizable credentials, like the PWA seal. But putting the PWA seal on your personal marketing materials isn’t just for clients … it’s also for you. Investing in PWA membership is a strong signal to yourself that you’re ready to treat your writing as more than a hobby – you’re ready to be a professional, earn a professional copywriting rates, and enjoy all the benefits of the writer’s life. Richard says the final secret of success is to get good – FAST. PWA helps make that possible by putting all the critical resources and copywriter training you need in one place. Access to exclusive “Ask The Expert” interviews with A-list writers and market leaders, plus special “member spotlight” sessions with your peers. You’ll gain a rare insiders perspective on how to grow your career, succeed in multiple niches, and maximize the fun in your copywriting life. Discounts on prestigious AWAI copywriter training programs, including hands-on coaching opportunities and live events specifically tailored to for copywriters. This brings more of the training you need within reach financially, even if you’re just starting out. Ongoing encouragement, feedback, and support from other PWA members and Managing Editor Jen Adams. You won’t feel alone in your journey, and with a supportive team on your side, you can shave months (maybe even years) off your learning curve. 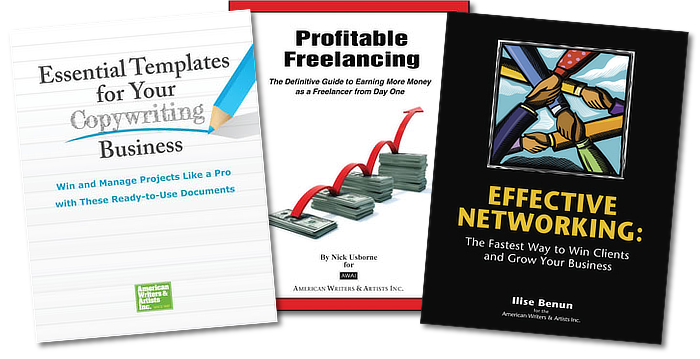 Each of these “get good FAST” resources flows naturally into opportunities to land freelance writing clients interested in your new skills. When you choose to fast-track your success by joining the Professional Writer’s Alliance today, you’ll receive a three special FREE gifts in addition to your Alliance Dollars and all your other regular membership benefits. 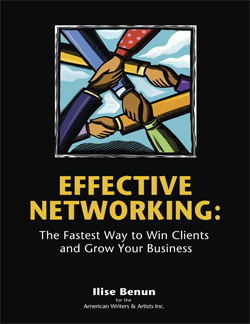 Ilise Benun’s Effective Networking: The Fastest Way to Win Clients and Grow Your Business (A $179 Value). Ilise is a master at helping writers build connections – especially shy, introverted writers who’d rather be at home in their pajamas than caught dead at a networking event! Her step-by-step system – trusted by industry leaders like the legendary Bob Bly – reveals how you can avoid dull, pointless networking in favor of simple activities that get real results and build meaningful relationships with freelance writing clients. The end result? More writing success and less networking stress. 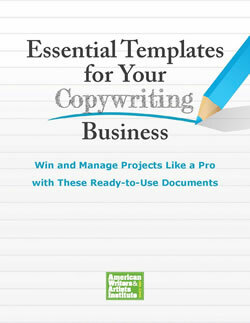 AWAI’s Essential Templates for Your Copywriting Business (A $129 Value). The 16 ready-to-use templates included in AWAI’s exclusive bundle take just minutes to customize for your own freelance writing business. From client intake forms to project management documents to a polished final invoice, managing your copywriting career is a breeze with these forms on your side. 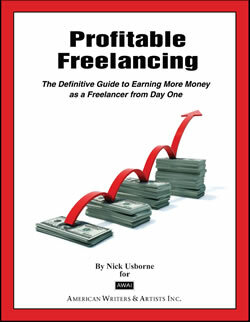 Nick Usborne’s Profitable Freelancing (A $279 Value). You don’t have to work for pennies – and Nick Usborne’s here to make sure your copywriting rates reflect the real value of your skills. Inside Profitable Freelancing, you’ll see why charging below-market copywriting rates could be costing you clients … and how to fix things, fast. Plus, everything inside has been field-tested by Nick over his four decades in the business, ensuring that your bottom line benefits from his real-world experience. These gifts – collectively valued at more than $600 – are your reward for taking action now. And, should you decide for any reason that PWA membership isn’t for you, these three gifts are yours to keep as a “thank you” for giving our organization a try. There’s a big twist ahead – one that makes joining the Professional Writer’s Alliance essentially FREE to you. Alliance Dollars are PWA’s private currency, equivalent on a one-to-one basis with your regular monthly dues. Currently, membership in PWA – and access to every one of the organization’s valuable benefits – is just $58 per month. But thanks to PWA’s Alliance Dollars program, the net impact on your bank account each month is actually zero. PWA’s Alliance Dollars can be spent on the industry-acclaimed copywriter training programs, hands-on coaching, and live events sponsored by American Writers and Artists, Inc. (AWAI). And, for every year you remain a member of PWA, the group adds a bonus $100 to your “bank account” of Alliance Dollars. So each time you pay your monthly PWA dues, you effectively “bank” an equivalent amount of credits for your own skill-building investments. Add in the annual $100 bonus credit, and you quickly come out ahead financially with your PWA membership. No wonder industry leaders like Richard Armstrong consider PWA the smartest choice you can make for growing your copywriting career! The copywriting career you want is within reach. All you need to do is click the “Join PWA Now” button below to be welcomed into our community, get your free gifts, and start accruing your Alliance Dollars.